I have a question. 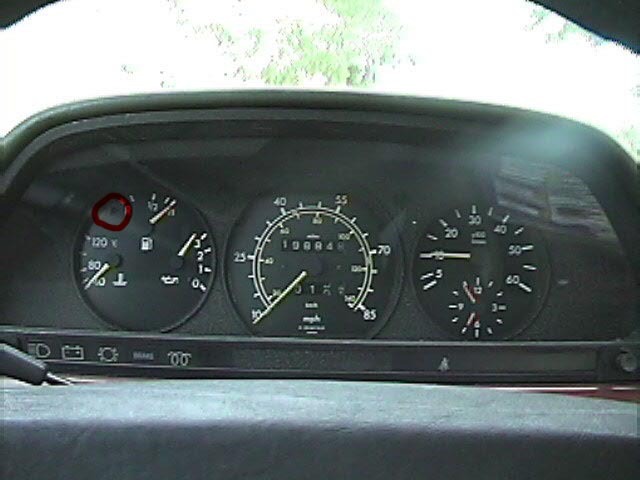 I once test drove a 1985 300D, and when the lights on the odometer cluster lit up before the car was started, the little yellow light on the fuel gauge lit up. But on my 1981 300SD, the little yellow light does not light up before I start the car. Is it that on 300SD the light does not light up, or is the bulb out or something? I circled the light I'm talking about. I hope the picture shows. Generally, when all the indicator lights light up prior to start-up, that is a general "test" of all the bulbs. If they don't light up, that is an indication of a bad bulb and obviously, the purpose of that particular indicator is useless. When you think about it it makes perfect logical sense. How would you ever know a particular indicator works or not if the bulbs fail ??? My Other Car is a Porsche. When it stops leaking, I'm out of oil. Logic was wanting, I'm afraid. The factory changed the circuit in September 1982. Prior to that date the light would only come on when you had 3 gallons or less fuel left. From 9/1982 the light comes on when the ignition is on but before you start the engine, as a check on its function. It's less bright in this check mode than when it is indicating low fuel. Thus, if your light only comes on at 3 gallons and your car is pre-9/1982, everything is functioning as designed. This applies to the W123 and W126 (yours) chassis. Well I know the indicator won't work with the bulb out, like you said, "it makes perfect logical sense." But how do you get back behind the instrument cluster to replace the bulb? Forget some of that last post. I guess the only way to find out if the light works, is to drive around alot until I only have 3 gallons of fuel left. Since I rarely drive without less than 1/2 tank, I suspect the bulb still works, although it ran out of fuel in 1987 or 1988 once, when I was a little one, and not in the car. I could try to install a new bulb, or is there any way to test the present bulb without driving to three gallons? Great "how to" on the instrument panel. Any Ideas on how or if the Digital temp readout can be replaced ?? Mine's starting to blacken out. Another issue MB didn't think of. Can't you access the digital readout when the instrument panel is removed? It look like it just pops in there. Replacement is probably in order if the LCD is shot. My 1983 300SD has no such readout (my 1990 560SEL has it) yet the 300SD panel clearly has a place for it, making me think it is easily removed. If it just pops in that's great. I guess the trick is finding one. I can't find one anywhere. Have you priced them at the dealer? This makes sense, since Butterball has a build date of 6/82. Here's some more info, which may just confuse me more. If I put in an 85 cluster (just the left section), the low fuel light comes on during the pre start test. I've swapped bulbs, measured resistance between pins 4&5, and everything else I can think of, and the 82 cluster will not light on startup. I ran out of fuel before, but since it had a clogged tank screen, I'm not sure it was close enough to empty to turn on the low fuel light. In my case, it seems as if I want a low fuel light, I'm gonna have to find an 83-85 cluster section. That makes sense, the circuit that lights the bulb in "test" mode when the key is turned on would be internal to the cluster. I found the same thing when I replaced the cluster in my 82 with a later version (due to a leaky oil gauge). If you want that "test" function, AFAIK you will have to replace the left cluster section with the later version. Edit: I just reread your post, AFAIK the low fuel light will still work correctly (when you a low on fuel) even if it doesn't have the "test" function when you first turn on the key. Al that function does is tell you if the bulb is burnt out. My 82 works correctly with both the old and new style cluster. Last edited by Craig; 12-31-2005 at 09:02 PM. Thanks. Sort of a weird design, imo. The information appears to still be on the site, however it will cost you $30 to see it. Search here for "126 instrument panel" and you will likely find something. If I recall correctly, it pulls out toward the driver.